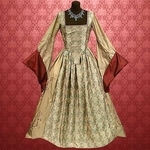 Pearson’s Renaissance Shoppe is your source for beautiful Renaissance and Medieval Dresses. Spanning the Dark Ages to the times of Pirates ruling the seven seas, our Renaissance costumes for women are authentic and comfortable. But we shouldn’t get caught up with just medieval knight armor or pirate wench costumes – even princesses and maidens should be able to find their own Renaissance period clothing. While the knights are busy jousting, and the gluttons are busy feasting, you can wear one of our Renaissance costumes to present yourself as an elegant and civilized daughter of a nobleman. This means that the next time you attend a reenactment, faire, or festival, you will be sure to turn the heads of young suitors looking to secure the hand of a young maiden. And if you find a suitor you like, we can create a stunning medieval style wedding dress for your fairy tale wedding!